I’m a music nerd. But, even if you’re not a music nerd, I think it’s an incredible thing to be able to read and write music. It’s like you’re learning a whole other, beautiful language that can help you “talk” to so many people. Being able to read notation or tab is helpful for learning songs quicker, being able to link up with other musicians, and many other reasons. I’ve been using Guitar Pro 6 for years (first released in 2011). 6 years is a long development cycle, so I was surprised to see that Guitar Pro 7 was released this year. I contacted the good folks at Arobas Music and asked to check out GP7. If you’re in a TLDR mood, I would say that the wait was worth it, and Guitar Pro 7 is a great program to pick up. If you’d like to learn why Guitar Pro 7 is great, let’s get right to it. The first thing that I noticed right away was how different Guitar Pro looked. From the interface to the actual notation itself, Guitar Pro 7 has received a big upgrade to its aesthetics. The usability of the program has also taken a leap because of the three sections you’ll use. On the left panel you’ll have your Edit panel which gives you all the notation elements you could ever want as a guitar player. On the right side you have the Inspector. This is similar to a program like GarageBand or Logic, where whatever track you’re currently on will be inspected and its properties will come up on the right side of your screen. This is helpful for changing sounds, tunings (multiple tunings for 6, 7 and 8 string guitars), track information and more. You also have your Global view on the bottom which houses all of your tracks, level and pan information and song sections. I also enjoy having my transport (return to zero, rewind, fast forward, play) and other helpful information right at the top middle section of my screen. The way the notation/tab looks is something similar to a transcription you’d see in Guitar World/Player. It’s very easy to read on the eyes, and has a number of styles you can choose from. Guitar Pro 7 can notate a number of instruments, but I also wanted to talk about a couple of guitar specific features that you might dig. The first one is the ability to plug in to an interface and make use of GP’s amp sims and effects. They have tons of presets to pick from, and using their built in effects for songwriting/transcription help ease up on your computer, because you don’t have to have so many programs open at once. This allows you to just work in one window and not have to jump around a bunch. Another cool thing Arobas has added is a polyphonic tuner. If you’re not sure what this is, it’s a little bit of magic. Similar to something like the Polytune pedal, Arobas’ tuner allows you to play all of your strings at once and it’ll let you know what strings are sharp and what strings are flat. I tried this out myself and it was pretty accurate. Other big advancements for guitarists are how the bends sound while you’re playing a song. They’re more natural and less keyboard like. They’ve also added a number of different guitar accentuations for you to add to your transcriptions, with new ones coming this version for classical guitar (golpe, etc.). Guitar Pro 7 has over 1000 presets when it comes to their RSE bank of sounds. My recommendation to you here for sounds is to pick a set of sounds you enjoy, and stick with them. They’re still a little video-game esque, and MIDI sounding, but they’re sufficient for being able to write a song and understand what it sounds like. That’s one of the most important things you can do for yourself as a beginning guitar player. If you’re unaware what 4 quarter notes sounds like, or what a C# minor chord sounds like, or what a rhythm sounds like, one of the easiest ways to understand those concepts is to write them out and hear them back in a program like this. If you were using Guitar Pro 6, don’t worry, you can export your GP 7 files as GP 6 files. They might not look entirely the same coming from GP 7 to 6, but for many of you out there, you’re still using Guitar Pro 6, and it’s helpful to have this ability while you upgrade to version 7. Another helpful update is the ability to export your songs as MP3’s. In the past you had other file formats (which are still present), but if you’re looking to send song ideas to bandmates, having the smaller MP3 file size is a win. If you want to work quickly in Guitar Pro, one of the best tips I can give you is to learn all the hot keys. Do you enable palm muting, legato, triplets or something else regularly? Learn their hot keys and you’ll fly through transcribing. 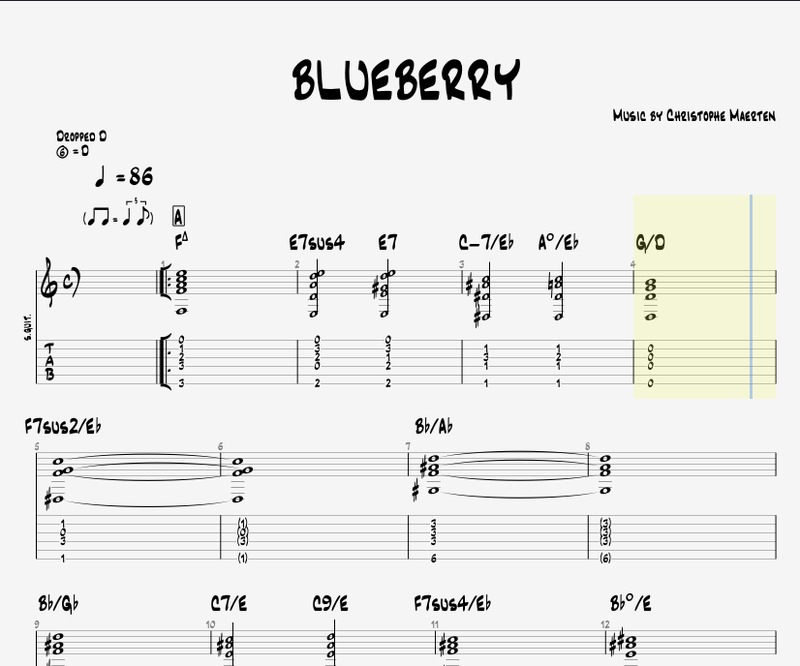 One of the best ways to learn how to use Guitar Pro is to take a slow, easy song and try to transcribe it. Or, open up one of the demo songs that Guitar Pro has provided, and see how they laid out the transcription. These demo songs give you a good idea of many of the ways you can configure Guitar Pro, how the sheets can look, and what sounds you’re likely to hear. Pricing and Is It Worth It? As I said at the beginning of this review, being able to read and write music will open your guitar playing up to a whole new world. If you’ve never used a program like Guitar Pro 7 before, you owe it to yourself to purchase it and get familiar with it. If you’re trying to transcribe your songs, and you’re not doing something like a full orchestra, Guitar Pro 7 is for you. It is dramatically less expensive than something like Sibelius or Finale, while still being fully featured. Head to this link to check out Guitar Pro 7, and start making music!